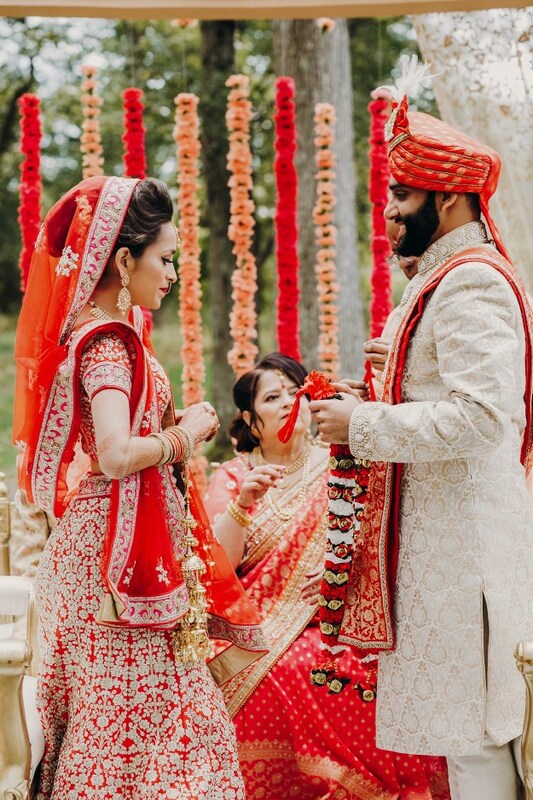 Big, brash and incredibly bold, an Indian wedding is a celebration full of customs and traditions, and an all-out party for hundreds of guests! A huge country full of different cultures, each region of India has its own cultural nuances that influence the pre- and post- ceremony rituals, but all are focussed on the happiness, harmony and prosperity of the bride and groom. 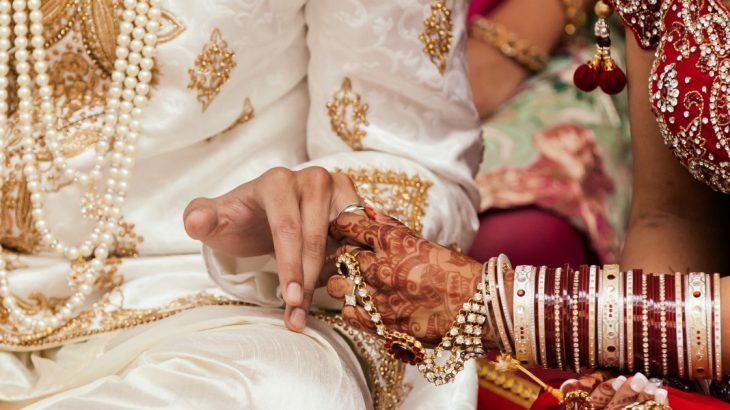 The date of a traditional Hindu wedding is divined by a pandit (priest) who uses the stars to find the couple the most auspicious date on which to wed. The whole wedding lasts about three days, with pre-wedding rituals like ‘mehndi’, where the bride and her female family members and friends have their hands and feet henna-ed, and ‘sangeet’, a sort of mini reception where the bride’s and groom’s families come together for the first time with dancing, singing and food, on days 1 and 2. Day 3 is the ceremony and reception, the whole thing lasting about 16 hours! The groom has his own processional, parading up to the ‘mandap’ where he greets his parents and the bride’s parents, who all then remove their shoes and enter the sacred space to await the bride. The bride arrives with bridesmaids and flower girls, escorted or carried by senior male members of her family. 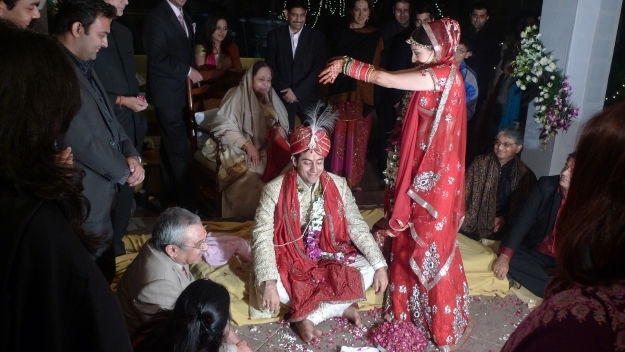 The wedding ceremony itself includes being physically bound together and steps around a sacred fire; Hindu couples can choose whether to exchange rings. The bride and groom then greet all the guests and receive their blessings before processing out of the ceremony. You’ll note there is no ‘you may kiss the bride’, to avoid offending the sensibilities of older relatives. The reception is a huge party with lots of delicious food and (depending on the couple’s religious beliefs) drink, dancing, entertainment, toasts and speeches. The bride and groom will have had a change of outfit at this point, but you can guarantee that it will be beautifully bright and embellished! The most popular and auspicious colour for Indian weddings is red so you can expect to see a lot of red saris and sherwanis but really, apart from white, any colours goes, and the brighter, the better! There are a number of popular nuptial styles in Japan, but two particularly – the big Western-style white wedding and a Shinto wedding. 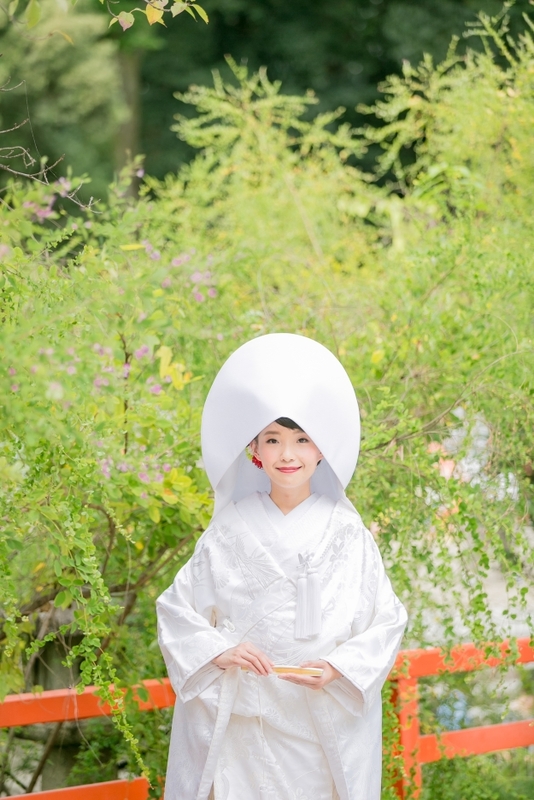 As traditional as a Shinto wedding ceremony is, it’s not actually very old; the first was in 1900 when the Crown Prince Yoshihito wed Princess Kujo Sadako. Typically, just close family attend the ceremony itself, with more guests attending the celebration for lots of food and drink, including friends and the even the couples’ bosses! 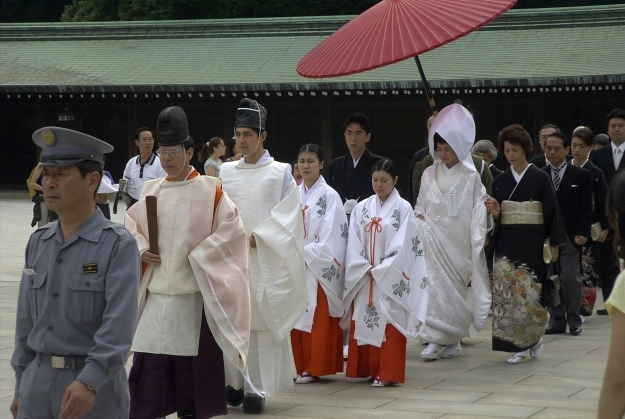 A Shinto ceremony is full of ritual, with the couple wearing a specific set of kimonos, the bride’s being white, and the groom’s including a jacket embroidered with the family crest. The bride also wears a tall wimple style headdress, which serves a similar purpose to a veil and a wig in a traditional wedding hairstyle. During the ceremony, three cups of ceremonial sake are drunk by the couple to strengthen their bond: one in appreciation of ancestors; the second representing the earth and caring for each other; and the third for people and fertility. The vows are read aloud to the shrine gods by the groom and the priest offers a branch of Japanese evergreen to the gods as a gesture of gratitude before the rings are presented. The reception has lots of eating and drinking but doesn’t usual include music and dancing – there can be an after-party for all that. Plenty of speeches are given, including a heartfelt thank you from the bride to her parents, a more recent addition, a self-made video all about the bride and groom – there’s not a dry eye in the house! Every guest leaves the wedding with a gift bag from the bride and groom as a thank you for attending the day, which includes thoughtful and useful gifts. Like India, China is a huge country that is home to a number of different ethnic groups, so no two weddings are alike. To be official married in China though, couples must take their vows before officials in the office of the Civil Affairs Bureau. Then, if they want one, the bride and groom can have a religious or traditional ceremony and, of course, a big celebration! On the day itself, the groom comes to collect the bride, who is held hostage by her girlfriends, but released for money! The venue will be decorated with lots of red, the colour of success, loyalty, honour and love, and gold, which represents wealth and fortune. Red is also the most popular colour for the bride to wear, and she might wear a traditional ‘qipao’, a Western-style dress or both! Lilies are the flower of choice as the word for lily, ‘baihe’ sounds like a popular saying ‘happy union for a hundred years’. A traditional tea ceremony to honour the families of the newlyweds is usually performed at some point during the wedding – maybe directly after the ceremony, or the day after. Parents, grandparents, aunts, uncles and so on will each be served a cup of tea, which they sip before placing a red envelope containing money onto the tea tray. One of the big differences between the weddings we are used to and a Chinese wedding is that the couple have their wedding photos taken before the wedding. This way, an elaborate album of them in various outfits taken in a studio or in scenic spots like the Temple of Heaven in Beijing, is ready for the celebration. The reception will include plenty of food and speeches, and a rather risky tradition for the groom – he must go around all the tables of guests taking shots of baijiu (rice spirit) with the male guests…the sensible ones sneakily switch to water after a couple! As the night draws to a close, the bride and groom personally say farewell to their guests and hand out a small favour, like chocolate or sweets. A Vietnamese wedding is deeply rooted in Confucian and Buddhist ideologies and involves a lot of ritual and set ceremonies. Held months before the wedding ceremony or all on the same day, the engagement party (le dinh hon) and betrothal ceremony (an hoi) are often considered the most important part of the affair. 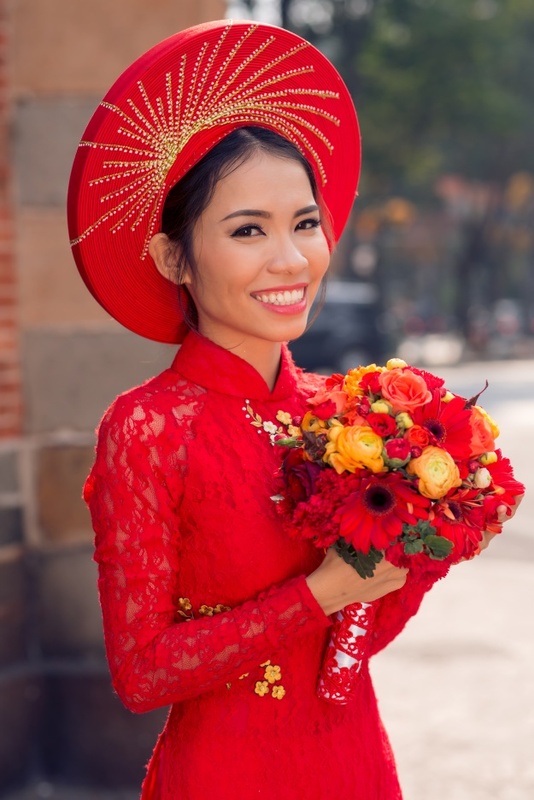 During these ceremonies, the couple will be dressed in traditional garb, an elaborate Ao dai and cloak with lots imperial symbols for the bride, most popularly in red or pink, and a simpler version for the groom in blue. The families gather together at the bride’s house and exchange symbolic gifts, such as wine, sticky rice and a whole suckling pig, and give the bride and groom their blessing. This is followed by a tea ceremony, and the older family members hand over monetary gifts. Everyone then processes to the groom’s house to the ancestor alter for another ceremony. Keep your eye out for some wedding action on your holidays to Vietnam, these wedding processions have been known to stop traffic! If the bride and groom choose to do all the ceremonies at the same time, they may next hold another ceremony, Buddhist or Catholic, and then have a celebratory reception! Vietnamese culture is full of superstition and a wedding is no exception, even its date and time. Most couples will go to a monk, spiritual leader or fortune teller to find the best date and time for their nuptials then, the number of gifts should be odd in northern Vietnam and even in the south, and the bride’s mother should brush her hair with a symbolic comb, just to name a few! The reception can be huge, up to 500 people and the dinner is traditionally Chinese food, and there’s a good amount of it – six to 10 courses! The couple will also take the time during the reception to greet all their guests, and there are plenty of toasts to them as well, a jolly end to a long day! Book an escorted tour to Asia with the UK’s leading Asia Experts, Wendy Wu Tours, or let us build you a tailormade itinerary, which can include any amount of local customs and traditions! Tour or tailormade, we can guarantee you an unforgettable trip. General culture, food and drink, weddings. permalink.